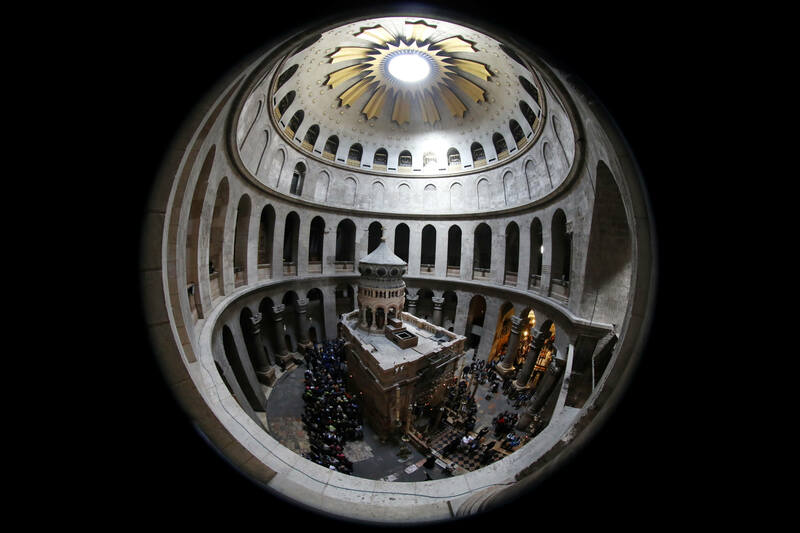 Photo Credit: CNS photo/Ammar Awad - The Edicule, the traditional site of Jesus' burial and resurrection, is seen at the Church of the Holy Sepulcher in Jerusalem. For anyone who has thought of visiting the Holy Land, Father Jon Schnobrich has just the pilgrimage for you: a 10-day opportunity to grow in faith that includes Palm Sunday in Jerusalem. “What a great time to go and grow in our faith,” said the director of vocations for the Diocese of Burlington, who will lead the pilgrimage April 5-15. The pilgrimage to holy places reflects the pilgrimage of the faithful here on Earth. “We believe we are not home yet. We are in this world but not of this world. We are on our way back to God, to heaven,” Father Schnobrich said, noting that pilgrimages are part of the Church’s teaching on the meaning of life here. Like the journey of a pilgrimage, life can sometimes be smooth while at other times difficult like climbing a mountain “that seems to go on forever,” he said. A pilgrimage, therefore, gives pilgrims the opportunity to grow in perseverance and to be grateful for blessings. The pilgrimage to the Holy Land will allow participants to “smell and breathe the same air that Jesus did, to walk the paths He walked, to eat the food He ate, to be in places of worship where He prayed and to see the places where the miracles we read about happened,” Father Schnobrich said. “We are not saved by a pope or a bishop or a priest but by Jesus Christ through His bride, the Church,” he said. The April pilgrimage through Tekton Ministries, which specializes in Catholic pilgrimages throughout the world, will depart from Montreal. Places on the itinerary include Netanya, Tiberias, Cana, Nazareth and Jerusalem. On Palm Sunday pilgrims from throughout the world will participate in the Palm Sunday Procession from Bethphage to St. Anne’s Church as they follow Jesus’ triumphal entrance into Jerusalem. The procession will take them along the same route that Jesus walked and is lined by people with palm branches. The pilgrims will be among thousands who make their way up to the Mount of Olives. Other sites on the pilgrimage include the Nativity Church, the Manger, the Church of St. Catherine, the Milk Grotto Chapel, the Shepherd’s Fields and the Church of St. Anne. The Via Dolorosa, the Church of the Holy Sepulcher, the Chapel of St. Helena, Pilate’s Judgment Hall, the Chapel of Flagellation, the Arch of Ecce Homo, the “Wailing Wall” and the Temple Mount are also on the itinerary. The price of the trip is $3,620 per person/double occupancy.